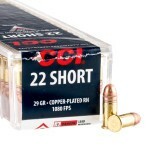 22 Short ammunition was introduced in 1857 along with the Smith & Wesson Model 1 as the first metal-cased cartridge developed in the United States. These black powder weapons were used during the Civil War, though the relatively low power of .22 Short ammo makes it unlikely that many soldiers used them as a primary weapon. 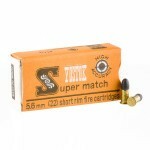 The relatively low case capacity of the cartridge is less of a limitation than it once was, since smokeless powder is considerably more space efficient than black powder. 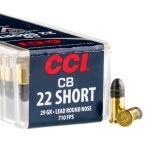 Originally intended as a short-range defensive cartridge (an application for which it is woefully inadequate by modern standards), the .22 Short remains in use today for both target shooting and hunting uses. During the 20th century, it was also used for Olympic and other competitive shooting events as well as shooting galleries at fairs and carnivals. 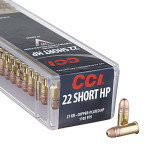 Compared to most other calibers, the .22 Short is very quiet and light in the recoil department, making it an easy round to shoot. 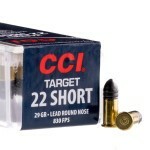 A typical round of .22 Short ammunition fires a 27-29 grain bullet at a muzzle velocity of about 1,100 feet per second. Target loads are typically less powerful than hunting ones. 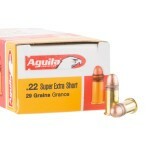 Although not suitable for most game, the .22 Short excels against squirrels, rabbits, rats, and other small pest animals. It is worth noting that some rifles are designed to fire .22 Short, .22 Long, and .22 Long Rifle. 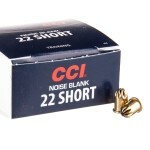 This is convenient for those who keep ammo of all of these calibers. However, such a weapon firing .22 Short ammunition will suffer somewhat in the accuracy department due to the extra length of the gun's chamber.